VenaSeal™ Closure System for Vein Treatment Varicose veins are a typical sign of venous insufficiency, which can become a serious problem if not treated. 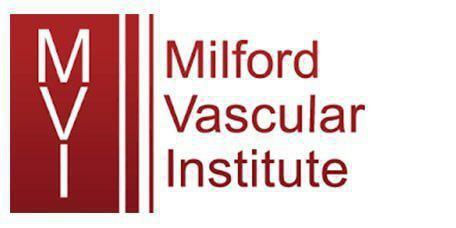 The experts at Milford Vascular Institute are one of the first practices in Connecticut to offer the new VenaSeal™ Closure System for treating chronic venous insufficiency. The VenaSeal™ is the only venous closure procedure that does not require injections to numb the entire leg, does not use heat to close the vein, and does not use a sclerosing solution. During this procedure, a medical “super glue” is delivered inside the vein to close it. How does the VenaSeal™ Closure System Work? In the office, the leg is cleansed and prepped with Betadine solution. Lidocaine is used as a local anesthetic so the patient will not feel the initial incision needed to access the vein. The abnormal vein is identified with ultrasound and punctured with a small needle. A catheter is then inserted in the vein and advanced under ultrasound guidance to the abnormal valve. The glue is then applied in multiple steps from the valve down to the mid-thigh or knee. Gentle compression is done to allow the glue to adhere to the walls of the vein. This completely seals the vein, closing off blood flow and instead diverting blood to a different series of veins. A massive advantage of this technique is that after the procedure, the fact that a compression stocking does NOT need to worn afterward. Patients should begin to see and feel results immediately, but some veins do take up to a year to disappear completely. What Are the Benefits of the VenaSeal™ Closure System? The VenaSeal™ is a more gentile mode of venous closure. The VenaSeal™ treatment also has a higher success rate than the radiofrequency ablation or laser vein treatments. Advantages of this technique include the avoidance of multiple injections of anesthetic solution. The only incision you will have to made in order to insert the tube. Because of this, no stitches are required. Patients can return to their normal routine right away with no downtime. Who can have the VenaSeal™ Closure System? Unfortunately, in the state of Connecticut, the VenaSeal™ Closure System is only covered by Medicare and Medicare Replacement plans. If you are Medicare age, ask one of the vein specialists at Milford Vascular Institute for more information about this new innovation in the treatment of venous insufficiency. We will continue to monitor the private insurance companies and advise our patients if this becomes a covered procedure in the future.